URL redirect (URL forwarding) allows you to forward your domain visitors to any URL of your choice (to a new domain or a different website). You can set 301 (permanent), 302 (unmasked), and masked (URL frame) redirects for the domain names pointed to BasicDNS, PremiumDNS, BackupDNS (a legacy option) or FreeDNS. If everything is configured properly, it takes about 30 minutes to start working. Read more about different types of redirects. In case you need to connect your domain to some website-building service, please check 3rd Party Services Setup in our KnowledgeBase. If you have a hosting plan, you can simply point the domain to your hosting nameservers. NOTE: Click Add Wildcard redirect to create a wildcard record to match requests for non-existent subdomains. 2. Type your domain in the Source URL field (e.g. 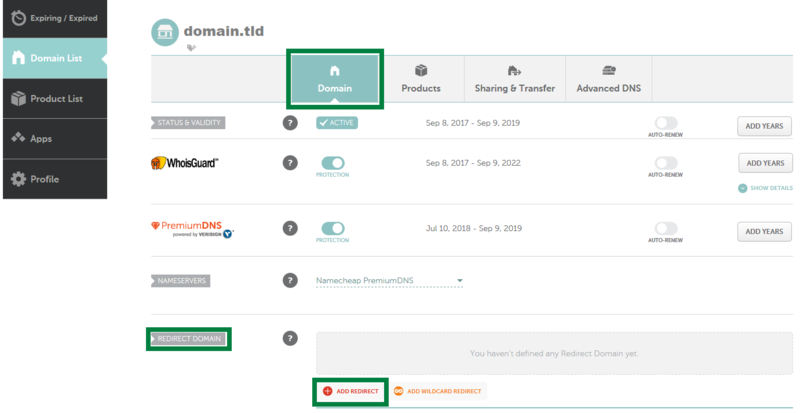 yourdomain.tld / domain.com / newdomain.info) and the link to which you need to forward your domain in the Destination URL field. If you want both yourdomain.tld and www.yourdomain.tld to be redirected, add the record for www accordingly. More details on the hosts you can use can be found in the "How do I create a subdomain for my domain?" article. NOTE: Your root domain (domain.tld) is marked with @ symbol in Host field here. That's it! The redirect should be working within 30 minutes. NOTE: For all newly-registered domains there are two default records present that should be removed once your custom records are added (the CNAME and URL redirect you see on the screenshot below). As a rule, it takes up to 30 minutes for changes to be accepted globally. NOTE: There is an additional A record in the domain zone file once the URL redirect is set for your domain. This A record is not visible in the Advanced DNS section. It simply points your domain name to our internal forwarding server and will be removed once the URL redirect record is deleted. NOTE: It is not possible to set up a URL redirect in the account for the TCP port forwarding from http://www.domain.tld (uses port 80) to https://www.domain.tld (working via port 443). This type of redirect can be set up either via the .htaccess file or Namecheap SSL plugin in cPanel on if an SSL certificate is installed.. However, you can redirect from an http:// URL on your domain to a separate website with https:// (e.g. http://www.domain.tld to https://www.anotherdomain.tld) as this type of redirect is simple domain forwarding.